Have you ever been to a party where someone boasts about the antivirus he has just installed? I haven’t. And believe me even when we go to bar with the guys here from office, this isn’t what we talk about. At normal parties, people talk about the last holiday, argue over iPhone and Nokia, cars, ice hockey (in the Czech Republic) and sports in general (other places), politics (everywhere), hardware and gadgets, latest movies, mothers in law, kids and schools - but not about antivirus. I think this is because all of these subjects are, in one way or another, aspirational. Everybody understands and has opinion about politics and sports. On the other hand, most people with PCs don’t even know WHAT security brand they have installed and Mac users keep saying that they don’t need any. But don’t worry, I’m not going to talk about Macs today. I’m going to talk about Heidi. She is a good example of how aspiration rules discussion topics. 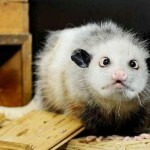 For those who have not heard of Heidi – the crossed-eyed opossum - I would like to explain that she became very famous all of a sudden about a year or two ago and her fame even brought her to the Oscars ceremony in Hollywood this year. I’m far from saying that a crossed-eyed opossum is what people aspire for! To the contrary, despite her crossed eyes, she is cute. And she is small and furry and has a very nice name. Most of us had a pet dog or at least furry stuffed rabbit that we cuddled with when going to sleep. And so the thought of cuddling and protecting little handicapped Heidi comes quite naturally. Hence subject for discussion. Proof? Here it is. Heidi has more Facebook fans than most antivirus companies combined. And, I don’t even need to mention the fact that no antivirus has ever been invited to the Oscar ceremony! Unfortunately, according to the officials at the Leipzig zoo, Heidi died two days ago and, unsurprisingly, her Facebook fan club is growing again. So good bye Heidi, we all loved you.